As of February 2017, Palmer amaranth (Amaranthus palmeri) had been found in 49 of Iowa’s 99 counties. A native of the American southwest, Palmer amaranth is more competitive than common waterhemp (Amaranthus tuberculatus), a pigweed native to Iowa. These two species are two of the most troublesome for corn and soybean farmers. Both species are known for fast development of herbicide resistance, incredible seed production on female plants (>500,000 seeds possible), and prolonged emergence. 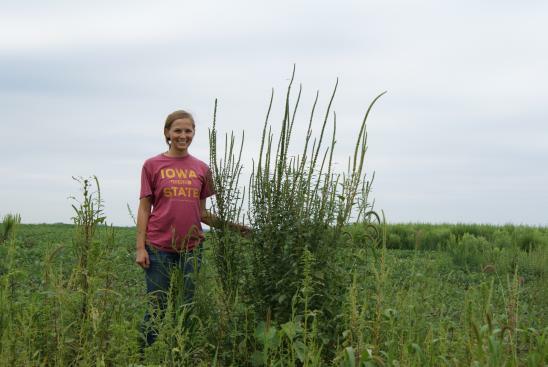 Palmer amaranth was introduced to many Iowa counties as a contaminant of native seed for conservation plantings last year, but it has also moved via traditional agriculture practices. In fact, in 12 of the 49 counties the first detection of Palmer amaranth was related to traditional agriculture practices. Equipment movement and feed and bedding for livestock are two of the most threatening sources of introduction. Other documented sources include bird seed and bird movement from the southern states north. Since most Palmer amaranth infestations are only a year or two old, eradication of this weed is possible in most fields. The addition of Palmer amaranth to Iowa’s noxious weed law as of July 1, 2017 highlights the importance of this weed to Iowans and its potential impact on Iowa agriculture. Eradication cannot happen without vigilance, identification, and appropriate response soon after it invades an area. Scouting is the only way to find and remove this weed in a timely manner. Palmer amaranth is reaching the stage where distinguishing it from waterhemp is much easier. In addition to fields where Palmer amaranth was found in 2016 or earlier, other areas to scout include 2016 conservation plantings, farms that utilize feed and bedding from southern states, fields receiving manure from those farms, areas with out-of-state equipment movement or high traffic, and fields near any of the above. Early in the growing season, Palmer amaranth is difficult to differentiate from waterhemp, but it does have several characteristics that would be unusual to find on waterhemp plants. Dr. Bob Hartzler posted an Amaranth identification quiz earlier this summer demonstrating the difficulty of vegetative identification of these species. Prior to flowering, look for leaves with long petioles (Figure 1). Petioles are the small stalks that attach leaves to the plant stem. Upper leaves are not as likely to have long petioles. Palmer amaranth is more likely to have ovate or egg-shaped leaves than waterhemp, and leaves on Palmer amaranth are often clustered at the top of the plant. People often observe Palmer amaranth as a leafier and denser-canopied weed as well (Figure 2). Both species are highly variable, thus the petiole is the most reliable vegetative trait. Figure 1. 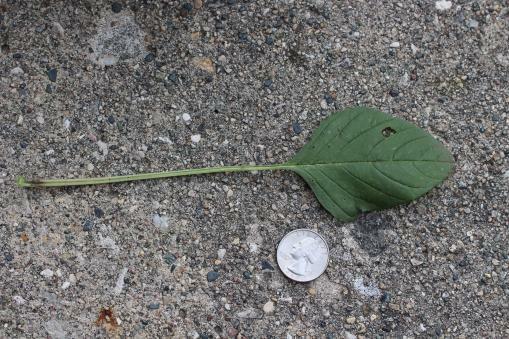 Palmer amaranth leaf with a petiole longer than the leaf blade. Folding the leaf over at the base is the fastest way to check for this trait. Figure 2. Waterhemp's open canopy (left) compared to Palmer amaranth's denser, leafy canopy (right). In conservation plantings, several of the “rules” of Palmer amaranth identification may no longer apply, especially after mowing. Dr. Bob Hartzler outlined some of the incredible variability in these populations in an ICM News article earlier this year. It is also important to correctly identify weeds from the beneficial forbs that are present in the planting. Once they flower, female Palmer amaranth are easier to distinguish from waterhemp due to their long, sharp bracts (Figure 3) surrounding the flowers on tall terminal inflorescences (Figure 4). If you discover this weed, steps should be taken to remove all plants to prevent seed production. Figure 3. 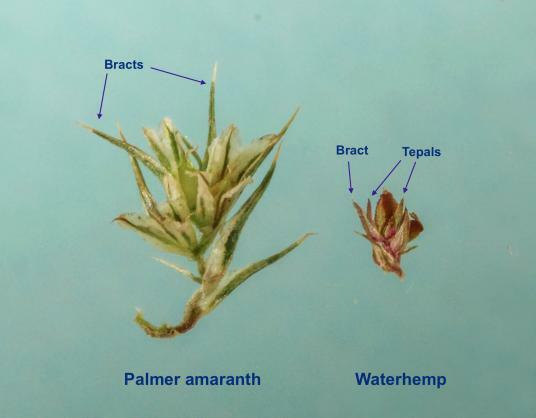 Comparison of a female Palmer amaranth flower and a female waterhemp flower. Figure 4. Female Palmer amaranth with tall terminal inflorescences. 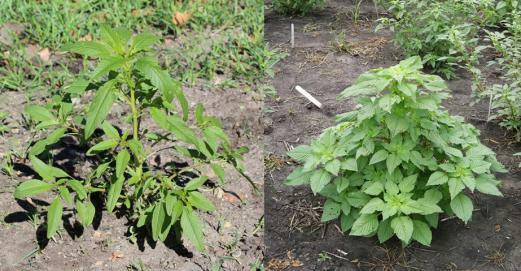 Palmer amaranth should not persist in conservation plantings, as perennial plants should outcompete this annual weed once the perennials are established. However, this may take several years, so management during the initial years is important to allow for good establishment of the planting and prevent Palmer amaranth from producing seed. Most 2016 plantings with good stands of natives appear to be effectively suppressing Palmer amaranth this year. Plantings with open gaps in the canopy will allow more opportunity for Palmer amaranth to survive and reproduce. While we believed Palmer amaranth contaminated conservation seed was limited to 2016 plantings, we have since discovered Palmer amaranth in a new spring 2017 seeding in Iowa. This appears to be a relatively isolated incident, but continued scouting of both 2016 and 2017 conservation seedings is necessary to detect this plant early. Landowners with conservation plantings established through the USDA in 2016 should have received notification earlier this spring outlining options for Palmer amaranth management in these plantings. Close communication with your local USDA Service Center is important to choose appropriate management strategies during this second year. Mowing during the first and second year of a prairie planting is a technique to prevent heavy weed pressure from suppressing prairie forbs and grasses. I’ve scouted several well-established 2nd year plantings and have suggested to avoid mowing unless absolutely necessary for establishment of the prairie plants, as mowing will open up the canopy and increase the likelihood of Palmer amaranth establishment. Continued vigilance is imperative to slow the speed with which Palmer amaranth invades our state. If you observe a plant that you think may be Palmer amaranth, please don’t hesitate to contact Bob Hartzler at 515-294-1164 or hartzler@iastate.edu or Meaghan Anderson at 319-331-0058 or mjanders@iastate.edu.